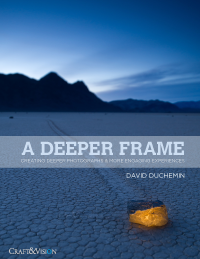 In this eBook,* duChemin explains how to achieve greater depth in ones photos. In photography, depth can mean many things but he makes it clear of what type of depth he’s referring to. He isn’t referring to emotional depth, conceptual depth or, in his own words, “rich symbolism that illicit the “”Whoa man, that’s deep,” responses from the black-turtleneck, art-nic crowd.” He discusses spacial depth and 3 dimensionality in the physical world. In essence, how to take a 3 dimensional world and portray it the way you want to in a 2 dimensional medium. He uses easy to understand terms and keeps it short,sweet and direct to the point, making it easy for beginners to comprehend. He goes into depth about how optics can affect the depth of an image. Focal length and angle of view can change your perspective and alter the depth in the image and explains the differences are between the two, which according to him, are two different things and can easily be confused. duChemin also speaks about how focus, controlling depth of field, changes in contrast (either by color, tone or light) can alter ones perception of depth. The whole book boils down to how, when composing, we should not see a square though the viewfinder, but rather a cube. A world not only with a height and width, but also with depth. It’s an often overlooked principle of photography. All concepts are accompanied by images to better explain his points. At only 23 pages long, it’s quick to read and should have you grasping the concept of depth and how to utilise it to your advantage in no time. And at only USD$5.00, it won’t break the bank either.